For the second year in a row, admins of the Clarington, ON VarageSale community got together to rally their members and organize donations for a charitable organization that was especially close to their hearts. “This year we … teamed up with the Refuge,” says Beth. An organization in Oshawa that helps homeless youth, the Refuge provides a space for children and teens to get a meal, a shower—and just as importantly—some support. 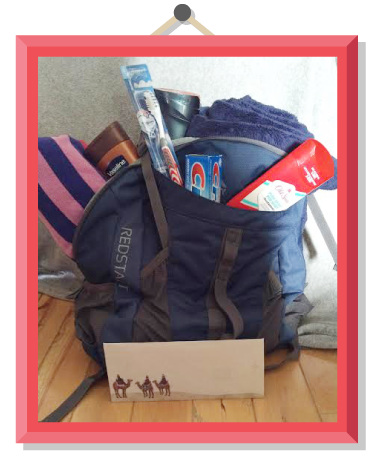 Every Christmas, the Refuge runs its successful backpack program, where giving members of the community are asked to donate backpacks overflowing with stuff for infants, kids and teens in need. The Refuge provides a list of items that would be ideal for each age group, making it that much easier for the charitable souls in the their community. 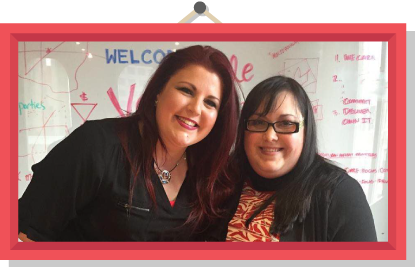 After pinning a post asking their members to participate, Andrea and Beth were delighted with the hugely positive response—and most of it within the first 24 hours! As they approached the December 4th donation date, these two selfless admins were humbled by the generosity of their members. 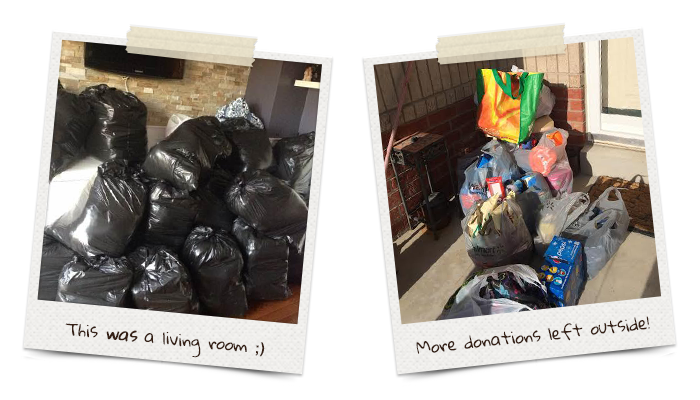 “We couldn’t believe how many donations kept coming in!” says Beth. Obviously moved by the mission of the Refuge and the vulnerable youth they serve, the Clarington community responded with open hands and hearts. A local dental clinic donated 30 new toothbrushes and 36 tubes of toothpaste. A new mother on maternity leave bought and donated 101 new blankets with her unused Christmas bonus. Others handed over everything from new backpacks to toiletries to canned goods to toys. Soon, neither Andrea nor Beth had enough space in their homes to store everything. And their garages were soon close to full. And the bags continued to pile up. Beth and Andrea worked diligently to organize and track every donation, sorting the old from the new and keeping Clarington community members posted on what items The Refuge still needed. Thanks to the generosity of their VarageSale community, Andrea and Beth were able to donate a trailer filled with items for infants, children and teens. Beth estimates their members dropped off around $3,000-$3,500 in new products alone, plus 20 bags of gently used items, $230 in gift cards and four large boxes of non-perishable food. When the admins rolled up on their drop-off day with their overstuffed trailer full of bags and boxes of goods, the Refuge staffers were inundated by the community’s generosity. Alexis Smid, the operations manager at the Refuge, agrees with Beth. Alexis had spoken to the admins prior to their drop off date, and only expected them to donate a few backpacks. 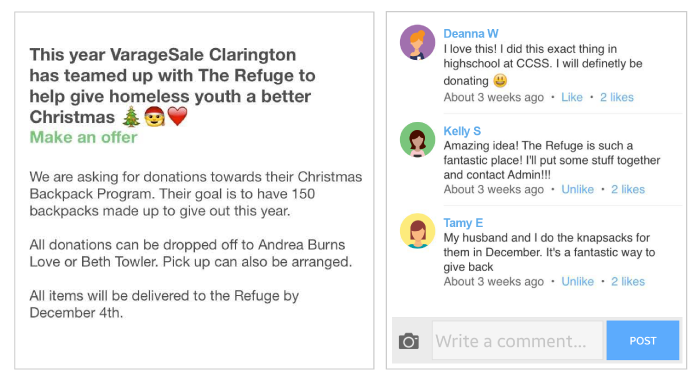 But after seeing the generosity of their community, she said Refuge staffers were shocked. “To our amazing surprise, there was a U-Haul full of stuff. We really weren’t expecting it,” Alexis said. According to Alexis, the Clarington community donations went a long way to fill backpacks that were short on items, and helped them easily meet their quota to ensure all the youth they serve get the items they need this Christmas. And she anticipates that those full-to-the-brim backpacks will bring a smile to the faces of their homeless kids and teens this year. “Our community is amazing,” both admins agreed. Whoa!! Almost $4,000 in donations… AMAZING!! To do something this wonderful takes hearts filled with compassion, where there is no room for judgement. And always with this much compassion and drive pulls in others like magnets. Leaders lead, and others help the dream come true. Congratulations! Merry Christmas to all, leading, working, giving and receiving!